Arturo Vidal will miss the rest of Bayern Munich's season after having minor knee surgery on Monday. After twisting his right knee in a fall in training last Saturday, Vidal had to be carried off the pitch by team-mate Franck Ribery and goalkeeper coach Toni Tapalovic, before being driven away on a golf cart. Bayern boss Jupp Heynckes said on Monday that the Chilean would need surgery to correct the problem, and the club confirmed on Tuesday that he would now sit out the remainder of the season. "Arturo Vidal underwent knee surgery by Dr Ulrich Boenisch in Augsburg on Monday," a statement on Bayern's website said. "The loose body [in his knee] that had been diagnosed beforehand was removed. The attachment of the rear lateral meniscus, which was damaged by the loose body, was repaired. The season is over for Arturo Vidal." In addition to missing Tuesday's DFB Cup encounter against his former club Bayer Leverkusen, the 30-year-old will also have to watch Bayern's UEFA Champions League semi-final tie against Real Madrid from afar. 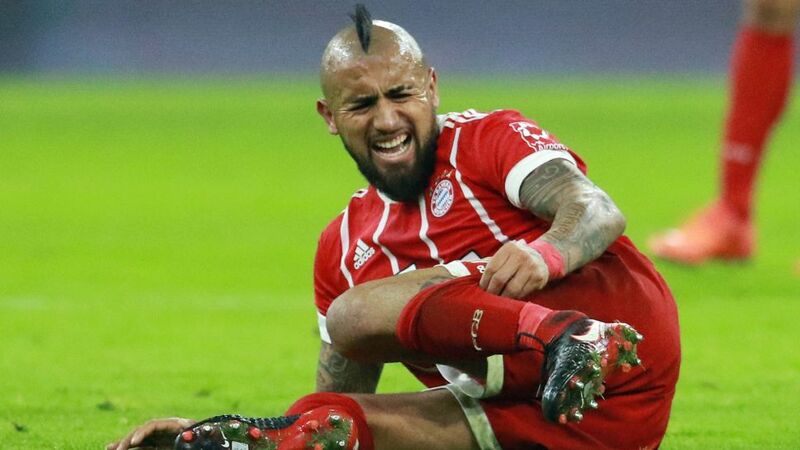 It is another untimely setback for Vidal, who was taking part in training for the first time since injuring his knee in Bayern's Champions League quarter-final first leg match with Sevilla a fortnight ago. Vidal has been a key player for Bayern this season, making 35 appearances in all competitions. He has scored six goals and provided two assists.